When you want quality tree and shrub trimming service, look no further than Ryno Lawn Care. We are committed to providing our customers with reliable, professional tree care services. Pruning and tree trimming experts dedicated to the proper maintenance and care of trees. We offer unique services customized to your specific property. 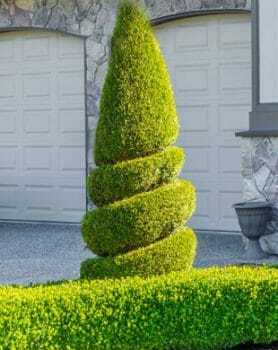 Nothing looks nicer than a well trimmed shrubs and bushes. Large or small, we can maintain the nice edges and lines. Various level and layers. The most common reason for tree trimming, is pruning the deadwood out of a trees canopy. Pruning out the dead and diseased limbs from a tree is good for the health of the tree. Diseased limbs are trimmed to prevent further damage that leads to deadwood. Trimming branches is important in maintaining your tree growth by keeping your branches properly. Trimming branches helps the tree thrive and prevents limbs from damage and potential falling hazards. Sometimes trees will dies or out grow your landscape. When and if you trees become a problem on your property, Ryno Lawn Care will take care of removing any tree or trimming a potentially dangerous limb. Large tree stumps can be unsightly and create an obstacle in your yard. Our stump grinding will clear out any stump and remove surface roots from the old stumps.